Harbourside Locksmiths garage security engineers can respond to lockouts and garage door problems quickly and efficiently providing a range of services to get you moving again. We are often able to gain access to your garage, without keys and can cut you new keys at your property for your convenience. If you find yourself locked out please call for assistance and we will respond 24 hours a day. Up and over garage doors unfortunately are a target for thieves, here at Harbourside we offer a supply and fit service to these doors. We recommend to fit high security bolts to the inside of your garage which solid steel bolt through both sides of the frames. These are a neat security solution which will put potential thieves off. 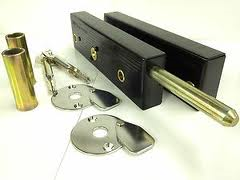 Even though these are supplied with triple sided high security keys we can get you extras cut please ask when calling. Most garage security can be quoted over the phone so please call for free advice and quotation.